With a big-ticket order of 50 aircraft, start-up airline air costa is in it for the long haul. But its challenges are many. When India's new airline air costa placed a $2.9-billion firm order for 50 jets with Brazilian aircraft manufacturer Embraer in February, the message was clear - the start-up was no fly-by-night operator but was in it for the long haul. "The idea to book a big order at the Singapore Airshow was to get noticed and establish the airline," says air costa Chairman and promoter Ramesh Lingamaneni. air costa took off barely four months ago, but the regional airline's management is already brimming with plans. It connects major southern Indian cities Bangalore, Chennai and Hyderabad to Vijayawada, and also flies to Jaipur and Ahmedabad in the north. The Vijayawada-based airline plans to increase its regional footprint with flights to Madurai, Visakhapatnam and Coimbatore, and eventually spread its wings across the country. K.N. Babu, the airline's CEO, says air costa will have eight to 10 aircraft by March 2015 and plans to add four aircraft every year until 2018 when the new order kicks in. It also has options to buy 50 more jets. The airline is aiming for 25 flights a day by 2015 connecting smaller cities with the metros. "As in the south, where we connect Chennai, Hyderabad and Bangalore to small towns, so too in the west and north. We will follow the same model as we penetrate those markets," says Babu. air costa's takeoff has been smooth. It has had passenger loads of up to 73 per cent, repeat passengers and a record of no flight delays. But many challenges lie ahead for the airline, part of the diversified LEPL Group with interests in property development and infrastructure projects. So far, it is still a small one operating from its home turf, and has not expanded into markets dominated by big players such as IndiGo and SpiceJet. Moreover, these airlines have added capacity on the same routes that air costa plans to target, such as Varanasi, Bagdogra and other small cities. The ride could get turbulent. Apart from IndiGo, many of India's budget airlines have been saddled with massive losses for the past few years due to overcapacity and price wars. A report by aviation consultancy Centre for Asia Pacific Aviation (CAPA) said three carriers - Jet Airways, Air India and SpiceJet - are expected to post combined losses of more than $1.2 billion this financial year. It pegged the industry's accumulated losses over the past seven years at $8.6 billion and debt at $12.6 billion. "It is not aircraft acquisition that is a challenge for air costa but continuous and long-term flow of capital that will be required to keep the business going. Under-capitalisation has been the single biggest challenge for almost all start-up airlines," says Kapil Kaul, CEO, India and Middle East, CAPA. Saj Ahmad, Chief Analyst at StrategicAero Research, a Londonbased airline consultancy, is particularly pessimistic because of the weak fundamentals of an already overloaded sector. "air costa, in my view, is just another disaster waiting to happen. I'd like to be proven wrong, but I doubt that will happen," he says. "There is extremely poor value in the Indian aviation market right now." Ahmad is doubtful about the timely delivery of the Embraer E2 jets and expects them to arrive only by 2020. The airline says it already has plans to lease four aircraft each year until 2018 for six to eight years. "What will air costa do to bridge that gap? They certainly do not have the capital to burn on leasing jets at short notice," he says. "Fifty new jets is a huge number for a market as immature as India's. Making headlines is not the same as making a profit. air costa will find this out the hard way," says Ahmad. Analysts are also cynical because of the past record of regional airlines. 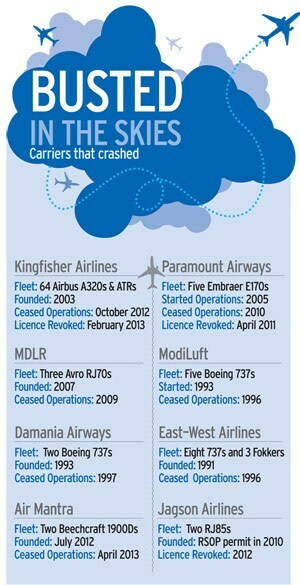 Many regional carriers in India - MDLR Airlines, Jagson Airlines and Air Mantra - crashed soon after their launch because of a combination of financial problems and policy-related issues. Some regional airlines failed when they tried to expand their operations. Chennaibased airline Paramount Airways is another example of a successful operator in the south which could not survive when it tried to go pan-India. Koustav Dhar, former head of MDLR and Jagson, says many regional airlines failed because none of the stakeholders realised the importance of a primary airport. "People seldom travel between smaller cities and they need a hub to feed in the passengers," says Dhar, now Managing Partner at Thailandbased Benetone Group, which helps set up airlines in South East Asia. He also has reservations about the ease of getting a pan-India operator permit, saying the cumbersome application process is the reason for the failure of many regional airlines. Lingamaneni acknowledges these challenges, but is confident air costa will ride them out. The airline's promoters have committed over $100 million over the next five years and are exploring funding options from export credit agencies such as BNDES in Brazil. As it stabilises operations, air costa will look for a strategic investor in a few years. The airline plans to apply for a national airoperator permit by the end of this year. "Funding for the venture will not be an issue, if the business requires more capital, we will get it," says Lingamaneni. He says the airline's decision to go for 112-seaters will give it an edge over other carriers that use 180-seat jets which do not fly at full capacity. "The leasing firm and manufacturer showed faith in our airline. We have our strategy and we will work it out. We will quietly expand until 2018. We do not want to make any noise in the market and we are here for the long term," says Lingamaneni. Some industry experts question his choice of aircraft. "This aircraft will not give air costa sops given to 70-seater types and will not be an advantage against the 180 seaters flown by rivals," says Dhar. Travel experts say regional players tend to be more successful in southern India because they are allowed to connect three metros - Hyderabad, Chennai and Bangalore - and the region accounts for at least 40 per cent of air travel in India. Not surprisingly, SpiceJet is trying to open up smaller routes in the south and IndiGo and GoAir are also looking at the region. Nevertheless, air costa may not find the going easy in southern India because of intense competition. It will have to take on not just established players but also new entrants such as Tata-Singapore Airlines and AirAsia India, a joint venture between the Tata group and Malaysia-based AirAsia. "The challenge is to compete with better and established players in a market looking at a similar price point," says Sharat Dhall, President, Yatra.com. Experts say air costa's success depends on opening new routes and the development of no-frills airports in smaller cities. G.R. 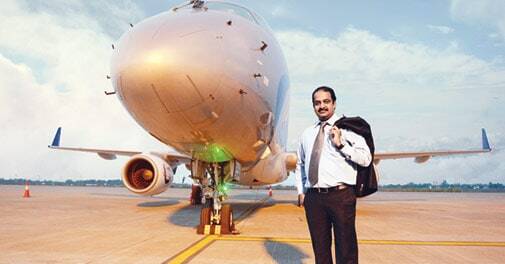 Gopinath, a pioneer of low-cost aviation in the country, says the regional airline will have to create new city pairs such as Mumbai and Agra. "More than 50 per cent of traffic today is coming from Mumbai and Delhi. There are no flights connecting Mumbai to Agra or to the Himalayan pilgrim centres," he says. air costa plans a flight to Shirdi in Maharashtra. One advantage for air costa is that it is entering the market at a time when there is a push to develop small airports. Amber Dubey, Partner and Head-Aviation at consultancy KPMG, says serious efforts are being made to create the infrastructure for no-frills airports in about 50 smaller cities. "No-frills airports, like their counterparts in the West, can be very basic structures, with no arrival lounges, no X-ray machines, no baggage belts, along with use of remote ATC (air traffic control), use of local police and near-free utilities from the local government," says Dubey. The CAPA report says the new government is expected to provide a strong push to develop 50-100 low cost airports to increase connectivity between smaller towns. "This is expected to be supported by a new regional airline policy consisting of a package of incentives and concessions to address the viability challenges that have been faced by airlines seeking to address this segment for the market," says the India outlook report for 2015.
air costa is unfazed. The airline aims to tap over 70 per cent of the population that lives in smaller towns and cities as the growing middle class travels more. "We believe that Tier II and Tier III markets will grow at a higher rate than the trunk route markets. We expect the industry as a whole to grow at a 16 per cent CAGR in passenger traffic terms over the next decade, and Tier II and III markets to grow at 18 per cent," says Vivek Choudhary, Chief Commercial Officer, air costa. River linking: Has politics trumped science and economics?